Daniel Ricciardo is hungry for the good days to return to Red Bull Racing after comfirming he’d be staying with the team until 2018. Heavily linked to the second Ferrari seat alongside former team-mate Sebastian Vettel from next year, Ricciardo pledged his future to the Tilbrook team on Thursday during the press conference ahead of this weekend’s Austrian Grand Prix. In the conference, he said Red Bull remained “the best place to be next year to challenge Mercedes” who have dominated the world championship since 2014. The Australian hasn’t been on the top step of the podium since 2014, but feels he should have had two wins to his name in 2016, but for poor strategy calls from his team. But after struggling in 2015 with poor reliability from their Renault engine, Ricciardo admits he needs to appreciate the good days a lot more. 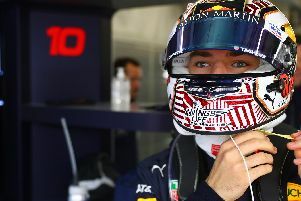 “Having had good equipment in 2014 to then going back a step in 2015, and then coming out of it - it has shaped me to me a more appreciative driver,” he said. “When it’s a good day, I made the most of it because not every day was good last year. And but for the wrong strategies in Spain and Monaco, Ricciardo would have won two races this year. While a source of frustration for Ricciardo, who turns 27 on Friday, feels the season has been a successful one so far for the Tilbrook-based squad. He said: “The season so far has been a lot more promising and positive than 2015. We’ve had genuine chances to win and be on the podium, we’ve had a few front row starts too. We haven’t lucked into it either, we’ve had genuine pace. “It’s a lot easier because everyone is happier and motivated. Once you’ve got the pace, it becomes easier.